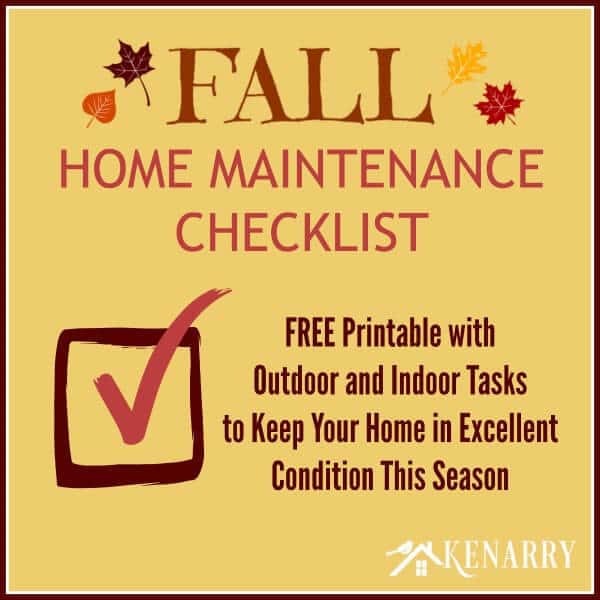 This free printable Fall Home Maintenance Checklist makes it easy to know how to keep your home in excellent condition, outside and inside, this season. 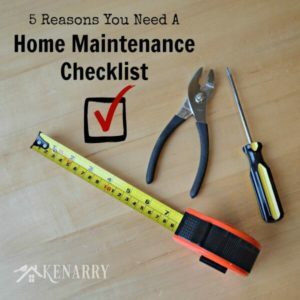 A few weeks ago, Karleia Steiner shared with us 5 Reasons Why You Need a Home Maintenance Checklist. 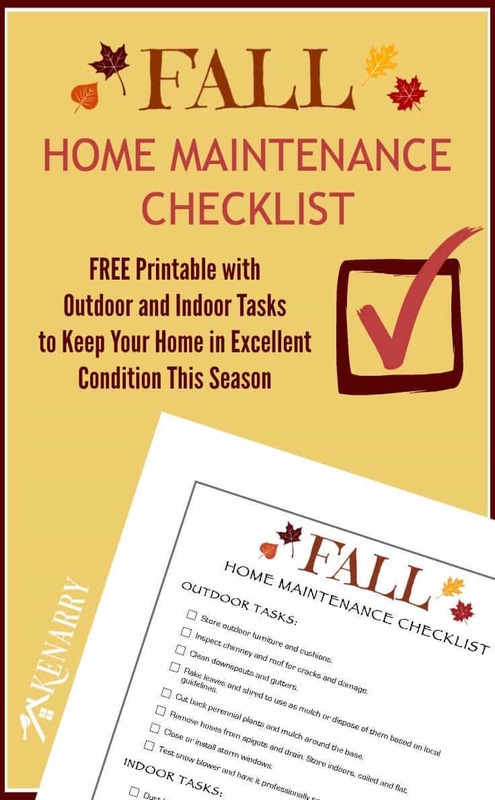 We thought it would be great to work with her to create a home maintenance checklist for each of the four seasons to help you keep your home in excellent condition all year-round. Inspect chimney and roof for cracks and damage. Cut back perennial plants and mulch around the base. See guidelines. Remove hoses from spigots and drain. Store indoors, coiled and flat. Test snow blower and have it professionally serviced if necessary. Dust blinds and wash curtains throughout your house. Clean kitchen and bathroom cabinets and dispose of outdated food, medicine and cosmetics. Check windows and doors for weather-tightness and install weather stripping where it’s needed. What else would you add to this Fall Home Maintenance Checklist? Please comment below to let us know. We’re always looking for new ideas. Also, be sure to subscribe to Kenarry so you don’t miss our Home Maintenance Checklists for upcoming seasons. 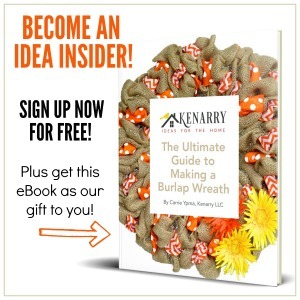 When you subscribe, we’ll also send you a FREE gift! This is such a brilliant idea – being a new home owner means I have no idea what I’m doing most of the time, so this list will really help me and the hubs keep on top of things! Thanks! Thanks, Erica! 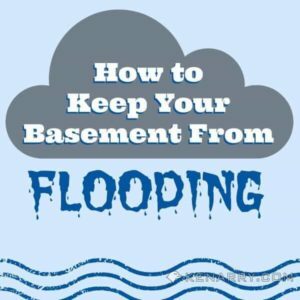 I hope it’s helpful as you prepare your new home for winter. So fun to have a home that’s really your OWN, though, isn’t it? This is such a useful list. Pinned and shared! Thank you for pinning and sharing, Amiejo! I’m glad you found the list useful and really appreciate that you shared it too! This is so handy Carrie! I really hope my friends see this. We have old ghetto single pain with storm windows in our house and are getting them replaced in a week hallelujah!! So many joys of owning a house. But we love it. I’ll be printing this off for my hubby and I ! Thanks, Karisa! I’m so glad this handy dandy checklist will be helpful to you and your husband. Do let me know if you come up with other things that should be added to the list! Great list, Carrie! We’re going to have nice weather this weekend so we will be making use of that to clean off the patio furniture and bring it indoors, etc. I will be printing your list to get some of those other tasks taken care of, too! Glad we could provide your to do list for the weekend, Bre! Let me know if you think of anything else we should have added. Enjoy the nice weather in your part of the midwest. I hope we get some of it over here too. Great check list! Thanks for sharing at the party. I really need to clean my blinds. I prefer to take them outdoors and hose them off on the ones I can. Great idea, Theresa! That would make it so much easier. Unfortunately, my blinds are all cloth so I can’t spray them off.